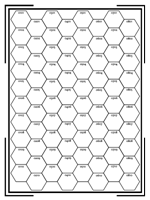 The classic Single Subsector Hex Grid is ideal for mapping your science fiction roleplaying game universe! This single sheet has the standard 80 hex grid and each hex is numbered in the familiar format. This is the ideal form for a starting point when developing your own universe using the current edition of Traveller. Download a free copy of Single Subsector Hex Grid from our DriveThruRPG.com page!